Welcome back to my blog for Day 2 of the Wild and Wonderful release blog hop! I think my favorite part of this new release are the delicious new ink colors. I feel like these two colors really rounded out some of the rainbow color scheme palettes. When you include Be Mine and All That Jazz--it's a beautiful combination, y'all!! You can drool over the entire release here. Let's get to the cards! The first card incorporates the new ink colors that you'll want to start blending IMMEDIATELY when you receive them! You can use one of the new background stamps and the new ink colors (along with some classics already released) for some awesome emboss resist effects, which I used on this card before trimming that piece down slightly and gluing it on to a cut and scored 4.25 x 5.5 inch card base. I also used a black marker to color the edges of the card base to make it look like it was black cardstock. 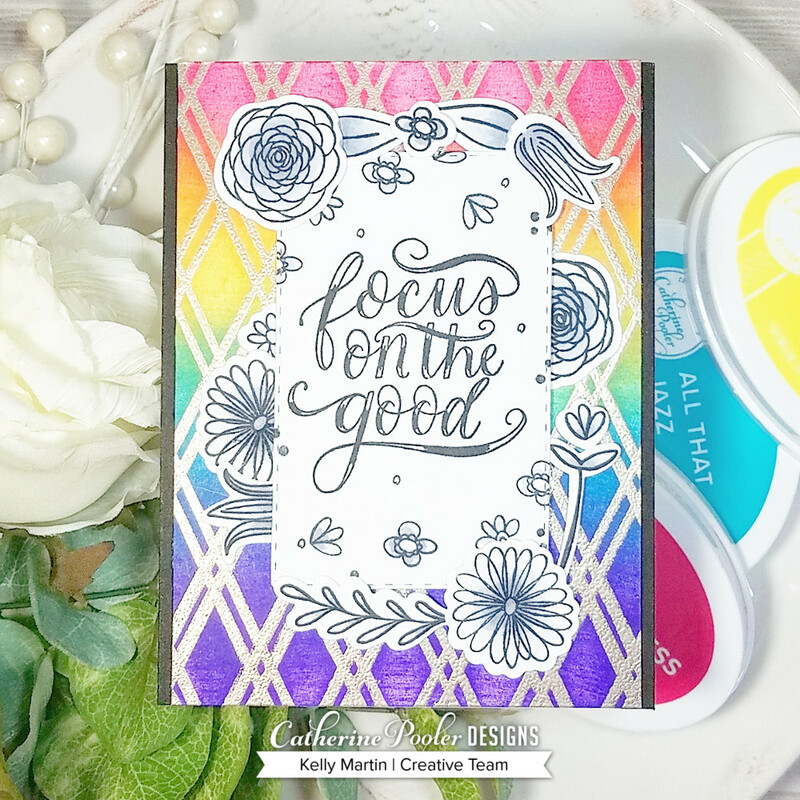 I also incorporated some of the floral images and sentiments from the Focus on the Good stamp and die set. I shaded those florals with shades of cool gray copic markers and also stamped the sentiment on to a smaller die cut panel. I mounted the smaller sentiment panel with a piece of craft foam and then tucked some of the images underneath the panel and then adhered some to the top as well. Breaking up the images this way helped tie it all together and give visual interest to the card. My next card was a little bit out of my comfort zone to make, but I was excited to see how it turned out! I stamped out some of the images from the Wonderful Wildflowers stamp set and then used the matching dies to cut them out. These images are so fun to color and you can use any coloring medium to get great results! I chose my Spectrum Noir Sparkle pens. I cut and scored a 4.25 x 5.5 inch card base from the Sand Dunes cardstock collection. I then tore up some pieces of patterned paper from the Black Tie Gala patterned paper collection and glued them on to a piece of vellum cardstock. I pulled up the edges just to make them pop off the card a bit more. I then glued my floral images on to the card, arranging them in a bouquet fashion. Some I mounted with foam tape and others I glued flat to the card. I then stamped a sentiment on to a white cardstock strip and glued it on to the card to finish things off. It's Day 2 of the Release Blog Hop! Leave a comment on each blog for a chance to win two free ink pads (and free shipping!) Winners will be announced Friday, May 25 on Catherine's blog. Thanks for stopping by today, and happy hopping! These are so pretty Kelly! 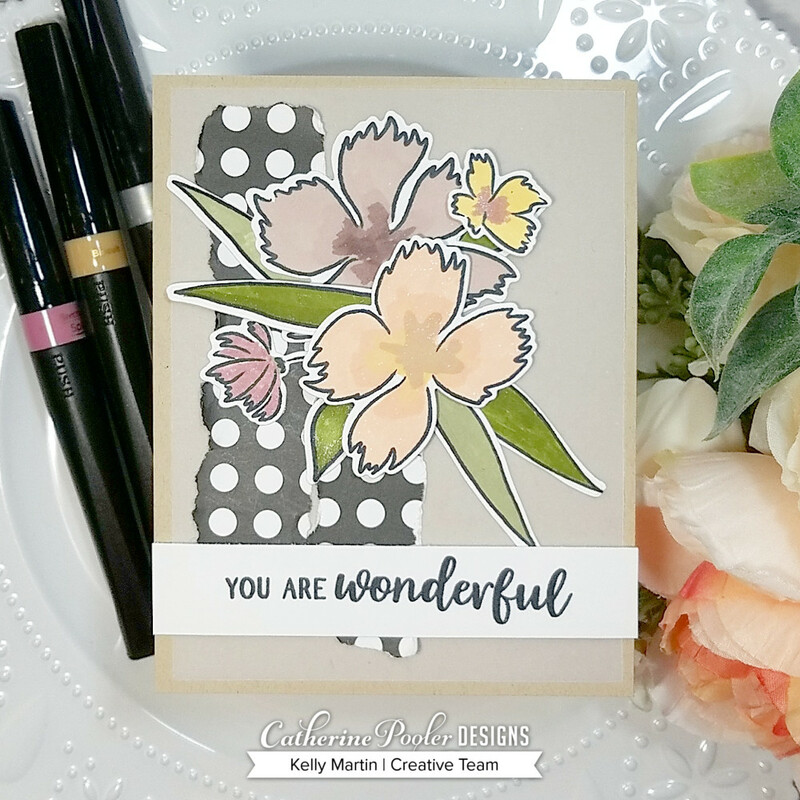 I love the soft colors of the florals on the second card! Amazing cards. I am always amazed at the creativity that goes into this. Beautiful cards! Love the new colors in your background on the first card. Awesome techniques, that I forget about, used in second card! 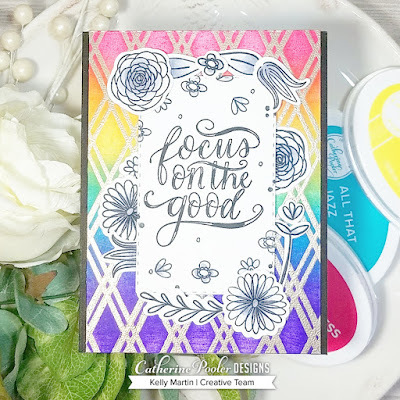 Love that rainbow blending on the first card! Both cards are beautiful. Love the polka dot paper you used. Great cards, Kelly. Love the ink blending on the first one. Thanks for sharing. I love how these new colors blend so good!! 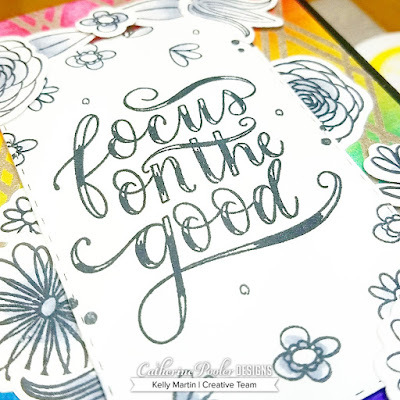 Great framing on your Focus on the Good card. Great cards! Thanks for sharing your techniques. I really like the colors on your second card - not the usual shades! Pretty floral cards. I like how they frame the sentiment on the first one. Great cards, Kelly! I love the torn paper - it really is a great element! Thanks for sharing your creativity and talent with us! Beautiful cards! I especially like what you did with the second one where you tore the paper behind the flowers! It really makes it pop! that 2nd card with the polka dots is beautiful, love how it balances those flowers. Love your cards and the the stamp sets. Love the you are wonderful card. Oh my gosh those cards are wonderful! The part so am most excited about is the ink as well. Love your ink blended background. The in between blended colors are great as well. The new stamp look like they are going to be a lot of fun. The background on the first card is so pretty. Your card with the wildflowers is my favorite with so many things to look at. Fantastic! Such fun and happy cards. Terrific inspiration using the new products. Beautiful cards!! Loved them both. TFS!! Love your blended background colors on 1st Card...so pretty. I enjoyed the softness of the 2nd color and so like the added torn paper accented the background of the flowers. Beautiful! I really like the flowers in the muted tones! Such pretty cards - love the flowers and the colors. Beautiful cards! Love the background on your 1st card! Wandering out of your comfort zone produced a spectacular card! Very pretty and nicely done! Both are lovely. Pretty colors. second card. Both are great. You’ve made a very choice showcasing these two cards because of the two very different color combos. But both are absolutely lovely !! Beautiful cards, Kelly! I love the torn edge effect on the patterned paper. I never think to do that, but it always looks so cool. Kelly, your cards a gorgeous! thank you for sharing. SO PRETTY! 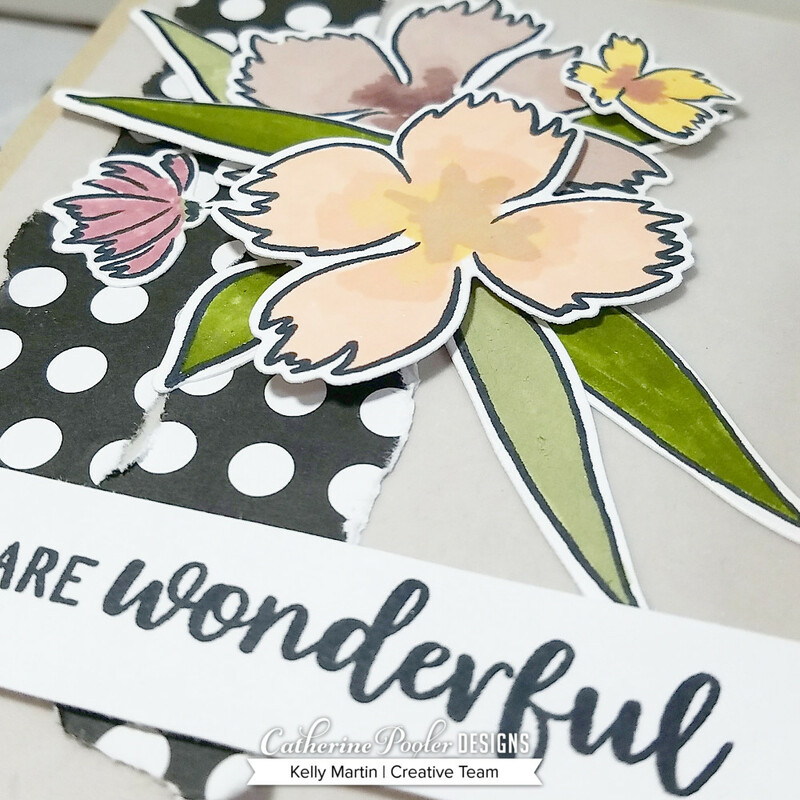 Love the polka dot paper with the soft gray background - so pretty Kelly! Beautiful! Thanks so much for sharing with us on this fun blog hop! !